The women's cross pendant in 14k white gold is designed with a cross inside a cross inside the textured pattern of the cross. 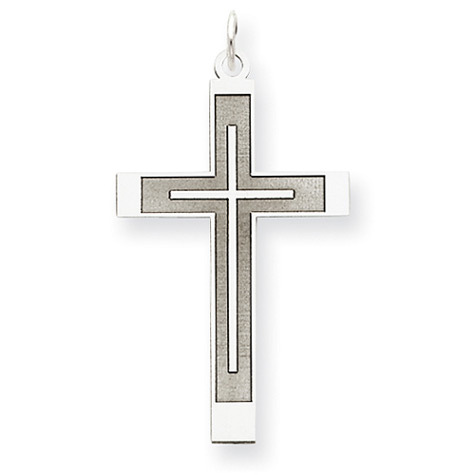 Considering getting a matching set with our men's white gold cross within cross pendant, shown below. The cross pendant measures 26mm (1") tall x 13mm (1/2") wide. Measurements include the hoop of the cross. "Favour is deceitful, and beauty is vain: [but] a woman that feareth the LORD, she shall be praised" (Proverbs 31:30). We guarantee our Women's Cross Inside Cross Pendant in 14K White Gold to be high quality, authentic jewelry, as described above.